Is content king? Apparently most instructional designers think so. Maybe that mindset is why we end up with so much boring training- both classroom and online. No doubt content is important. But too often IDs spend too much time word-smithing and tweaking content at the expense of engaging design that gets people talking. Talking? Yeah, you know, conversation. The best courses I have taken (and designed) included strategic use of conversation-based interactions that helped participants learn the content at a deeper level and make it personally relevant. Really well-done learning events, much like well-done messages of any kind, also tend get talked about outside of the course enviornment. Because people talk about what is relevant and important to them, we should design with that in mind. We should design conversation into our courses (live in the classroom, or via blogs, wiki, social networking, etc). And instead of focusing on perfect content, we should figure out how to deliver it in a way that gets the learner talking about it outside the course. That’s where the real applied learning happens. One way to do that would be to design post-course activities where participants work on projects in the field, and share their results with one another via blogs, for example. A conversation/collaboration strategy doesn’t have to be 2.0 tools only, of course. 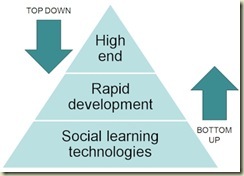 As Janet Clarey recently said, the challenge is to blend the best aspects of our current learning environments with the social learning technologies that support learning. Back in 2006, Corey Doctorow pointed out that “Conversation is king. Content is just something to talk about.” While he is referring to media business (specifically Disney), we should be looking at training design, too. Is content king? Maybe, but I say the ace of spades is conversation.